As the U.S. population is becoming older and many younger adults must find ways to care for their elderly parents, it is becoming more necessary than ever to ensure that senior home caregivers are providing optimal care. There are many facets to one’s health, but one of the most important is dental care. Oftentimes, it can become difficult to convince an elderly parent to visit a specialist, or even let the dentist at the senior care facility treat them. Therefore, in order to provide elderly parents living in senior living facilities the care and attention that they deserve, it is vital to look for certain qualities in a dental specialist that make treatment and care much easier. Above all, the most important quality that a senior care specialist must have is portraying a sense of comfort and empathy for the individual being treated. It isn’t always easy to treat senior dental patients, and many times, it can be quite difficult on the elderly parent. 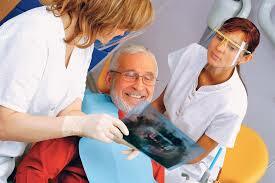 Therefore, both the dental specialist and the senior parent must feel comfortable with one another. If the senior being treated does not feel like he or she is in a safe environment that is responsive to his or her needs, treatment may become nearly impossible. Dental treatment can be extremely costly for both the caregiver and patient. An excellent and professional senior dental care specialist will understand the financial needs of the patient, and therefore the dentist should be able to work with the patient to find a way to reduce costs and make treatment financially feasible. Before ever allowing a dental specialist to provide treatment, it is highly necessary that the dental specialist be inspected for certification. A senior dental specialist will be certified by the American Dental Association, which means that the specialist must comply with the American Association of Dental Boards. By ensuring that the specialist is certified, both the patient and caregiver can rest assured that the professional is aware of how to perform treatment. By not seeking out a proper specialist, extra costs can potentially be invoked because of damage and improper treatment. Oftentimes, dental treatment can be quite intimidating for seniors. Hence, it is vital that the dental care specialist is able to communicate with the patient. The specialist should have the ability to review the treatment process, speak to the patient about concerns and issues, and needs to keep the patient informed at all times. Open lines of communication provide the care specialist and senior patient with an overall positive environment and treatment process. The necessity of finding a worthy senior care specialist cannot be understated. These days, many senior homes and facilities do not provide the necessary dental care and hygiene to senior care residents. Thus, it is up to the caregiver to find the perfect specialist for his or her parent so that the right care is given. Gabrielle Mahler, DMD, obtained her Bachelor’s in Psychology at the University of Pennsylvania, and then she was trained at the University of Medicine and Dentistry of New Jersey. She went on to do her residency in the Advanced Education of General Dentistry at Columbia University. She has been providing dental help for seniors for 8 years. Her philosophy when practicing dentistry is to treat each patient clinically while making their visit to the dental office as comfortable as possible. I agree that it is important to check for certain qualities in a dental specialist. g to my new dentist because she made me feel comfortable during the entire treatment. I hope that all of the dentists think of the welfare of their patients especially the senior patients. A great article and very informative. Keep up the good work. Love it. Thanks! A person at the old age goes through a lot of traumas.One of the main would be his body breaking apart.The loss of hearing ability..body pain..loss of teeth..etc.In such a situation a dentist acting wisely can lighten the situation giving a fleeing of relief to the patient.My father in law like to go to Dr Stephen Phelan at Ontario to show all his dental problems.The doctor ..the staffs there …He just enjoys all his visits!Great blog!